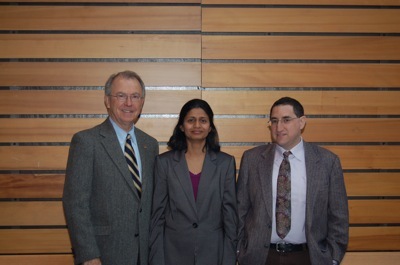 Congratulations to soon to be Dr. Pavithra Parthasarathi, who recently was awarded the 2011 John S Adams Award for Excellence in Transportation Research and Education, and who successfully defended her Ph.D. Thesis “Network Structure and Travel” (a draft of which is linked) on May 5, 2011. She accepted a job with the Hampton Roads Transportation Planning Organization (HRTPO) in Norfolk, VA, starting May 16th. Changing the design aspects of urban form is a positive approach to improving transportation. Land use and urban design strategies have been proposed to not only to bring about changes in travel behavior but as a way of providing a better quality of life to the residents. While the research on the relationship between urban form and travel behavior has been pretty extensive, there is a clear gap in the explicit consideration of the underlying transportation network, even though researchers acknowledge its importance. This dissertation aims to continue on the research interest in understanding travel behavior while explicitly accounting for the underlying transportation network structure. Transportation networks have an underlying structure, defined by the layout, arrangement and the connectivity of the individual network elements, namely the road segments and their intersections. The differences in network structure exist among and between networks. This dissertation argues that travelers perceive and respond to these differences in underlying network structure and complexity, resulting in differences in observed travel patterns. This hypothesized relationship between network structure and travel is analyzed in this dissertation using individual and aggregate level travel and network data from metropolitan regions across the U.S. Various measures of network structure, compiled from existing sources, are used to quantify the structure of street networks. The relation between these quantitative measures and travel is then identified using econometric models. The underlying principle of this research is that while the transportation network is not the only indicator of urban form and travel, an understanding of the transportation network structure will provide a good framework for understanding and designing cities. The importance of such an understanding is critical due to the long term and irreversible nature of transportation network decisions. The comprehensive analyses presented in this dissertation provide a clear understanding of the role of network design in influencing travel.